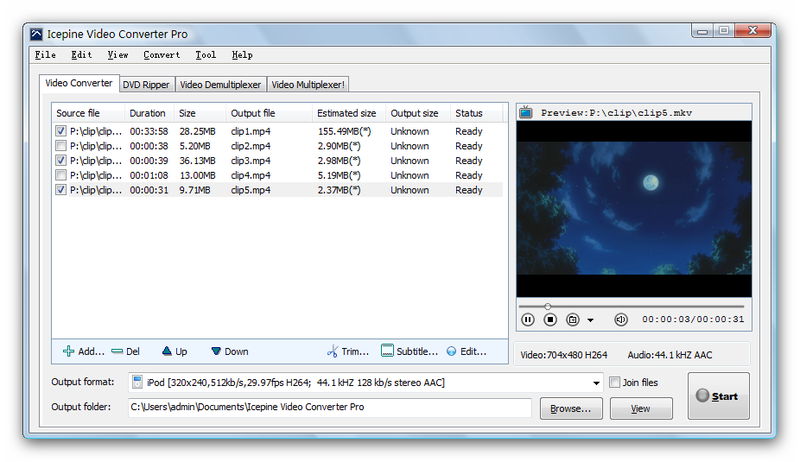 Icepine Video Converter Pro. Convert and enjoy your favorite movies anywhere! Icepine Video Converter Pro is an all-in-one, powerful, and easy-to-use video converter solution. A full-featured video converter converts your DVDs and videos in high quality and high speed to all popular video and audio formats(e.g. AVI, MOV, RMVB, MP4, WMV, 3GP, DivX, XviD, DVD, VCD, iPod Video, PSP Video, iPhone Video, etc.). The video demultiplexer extracts audio tracks and video tracks from AVI, MP4, 3GP, MPEG and MKV. And the video multiplexer merges audio tracks and video tracks together without quality loss. With Icepine Video Converter, you can put DVD movies, videos and musics on iPod, PSP, iPhone, Zune, Archos, Apple TV, mobile phone or any MP4/MP3/DVD players, watch them on the go or in the living room. Convert video and rip DVD to iPod, iPhone, Apple TV, PSP, PS3, Xbox, VCD, DVD, mobile phone, MP4 players and etc with just several clicks. Edit video and audio, support subtitle overlay, watermark effect, levels adjust, video crop, video resize, audio equalizer, audio normalize and audio gain. Join several media files together. Trim video files. Demultiplex audio and video streams from MPEG, AVI, MOV and MKV videos. Up to 300%-500% real time due to multi-core CPU support. Support batch conversion. Convert to all popular video formats with high quality. Support converting HD videos including H.264/AVC, AVCHD, MKV, TS, M2TS and etc.